Download "tmpfs: A Virtual Memory File System"
3 -3- cases where memory cannot be accessed through a file system. Anonymous memory is implemented using the processor s primary memory and swap space Tmpfs uses anonymous memory in the page cache to store and maintain file data, and competes for pages along with other memory users. Because the system does not differentiate tmpfs file data from other page cache uses, tmpfs files can be written to swap space. Control information is maintained in physical memory allocated from kernel heap. Tmpfs file data is accessed through a level of indirection provided by the VM system, whereby the data s tmpfs file and offset are transformed to an offset into a page of anonymous memory. Tmpfs itself never causes file pages to be written to disk. If a system is low on memory, anonymous pages can be written to a swap device if they are selected by the pageout daemon or are mapped into a process that is being swapped out. It is this mechanism that allows pages of a tmpfs file to be written to disk. The following sections provide an overview of the design and implementation of tmpfs. For detailed information about the SunOS virtual memory design and implementation, please consult the references [Gingell1987] and [Moran1988] listed at the end of the paper. To understand how tmpfs stores and retrieves file data, some of the structures used by the kernel to maintain virtual memory are described. The following is a brief description of some key VM and tmpfs structures and their use in this implementation tmpfs data structures tmpnode anonmap swap device seg_vn anon swapvp swapoff swapvp physical memory seg_map page swapvp swapoff Figure 1. tmpfs block diagram Figure 1 shows the basic structure and resources that tmpfs uses for files and their access. Their use in tmpfs is defined below. 4 vnodes A vnode is the fundamental structure used within the kernel to name file system memory objects. Vnodes provide a file system independent structure that gives access to the data comprising a file object. Each open file has an associated vnode. This vnode contains a pointer to a file system dependent structure for the private use of the underlying file system object. It is by this mechanism that operations on a file pass through to the underlying file system object [Kleiman1986] page cache The VM system treats physical memory as a cache for file system objects. Physical memory is broken up into a number of page frames, each of which has a corresponding page structure. The kernel uses page structures to maintain the identity and status of each physical page frame in the system. Each page is identified by a vnode and offset pair that provides a handle for the physical page resident in memory and that also designates the part of the file system object the page frame caches anonymous memory anonymous memory is term describing page structures whose name (i.e., vnode and offset pair) is not part of a file system object. 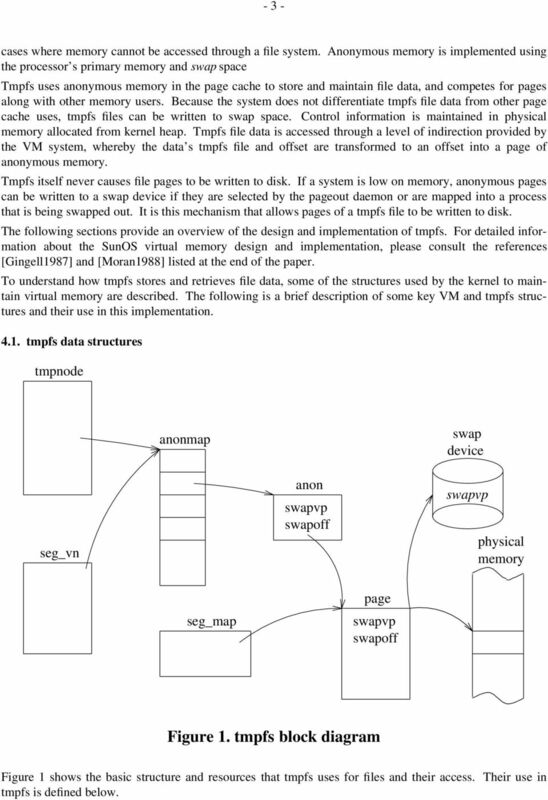 Page structures associated with anonymous memory are identified by the vnode of a swap device and the offset into that device. It is not possible to allocate more anonymous memory than there is swap space in a system. The location of swap space for an anonymous page is determined when the anonymous memory is allocated. Anonymous memory is used for many purposes within the kernel, such as: the uninitialised data and stack segments of executing programs, System V shared memory, and pages created through copy on write faults [Moran1988]. An anon structure is used to name every anonymous page in the system. This structure introduces a level of indirection between anonymous pages and their position on a swap device. An anon_map structure contains an array of pointers to anon structures and is used to treat a collection of anonymous pages as a unit. Access to an anonymous page structure is achieved by obtaining the correct anon structure from an anon_map. The anon structure contains the swap vnode and offset of the anonymous page tmpnode A tmpnode contains information intrinsic to tmpfs file access. It is similar in content and function to an inode in other UNIX file systems (e.g., BSD Fast file system). All file-specific information is included in this structure, including file type, attributes, and size. Contained within a tmpnode is a vnode. Every tmpnode references an anon_map which allows the kernel to locate and access the file data. References to an offset within a tmpfs file are translated to the corresponding offset in an anon_map and passed to routines dealing with anonymous memory. In this way, an anon_map is used in similarly to the direct disk block array of an inode. tmpnodes are allocated out of kernel heap, as are all tmpfs control structures. Directories in tmpfs are special instances of tmpnodes. A tmpfs directory structure consists of an array of filenames stored as character strings and their corresponding tmpnode pointers vnode segment (seg_vn) SunOS treats individual mappings within a user address space in an object oriented manner, with public and private data and an operations vector to maintain the mapping. These objects are called segments and the routines in the ops vector are collectively termed the segment driver. The seg_vn structure and segment driver define a region of user address space that is mapped to a regular file. The seg_vn structure describes the range of a file being mapped, the type of mapping (e.g., shared or private), and its protections and access information. User mappings to regular files are established through the mmap system call. 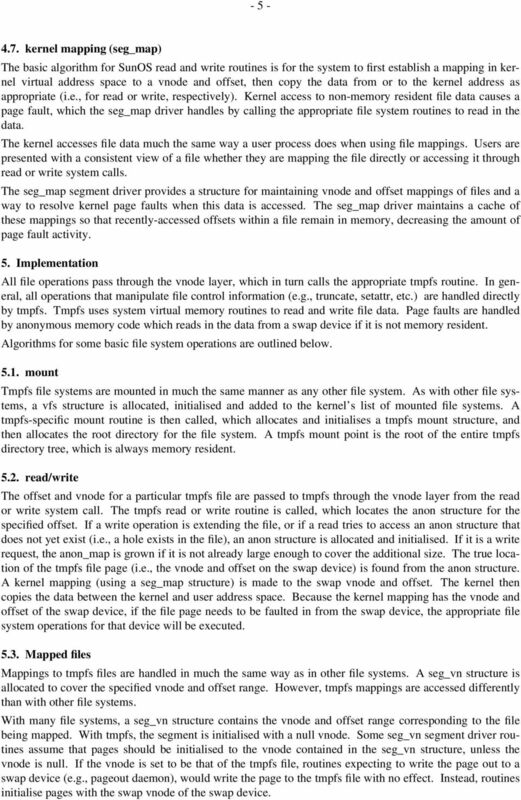 The seg_vn data structure references an anon_map similarly in structure and use to tmpfs. When a mapping to a tmpfs file is first established, the seg_vn structure is initialised to point to the anon_map associated with the tmpfs file. This ensures that any change to the tmpfs file (e.g., truncation) is reflected in all seg_vn mappings to that file. 5 kernel mapping (seg_map) The basic algorithm for SunOS read and write routines is for the system to first establish a mapping in kernel virtual address space to a vnode and offset, then copy the data from or to the kernel address as appropriate (i.e., for read or write, respectively). Kernel access to non-memory resident file data causes a page fault, which the seg_map driver handles by calling the appropriate file system routines to read in the data. The kernel accesses file data much the same way a user process does when using file mappings. Users are presented with a consistent view of a file whether they are mapping the file directly or accessing it through read or write system calls. The seg_map segment driver provides a structure for maintaining vnode and offset mappings of files and a way to resolve kernel page faults when this data is accessed. The seg_map driver maintains a cache of these mappings so that recently-accessed offsets within a file remain in memory, decreasing the amount of page fault activity. 5. Implementation All file operations pass through the vnode layer, which in turn calls the appropriate tmpfs routine. In general, all operations that manipulate file control information (e.g., truncate, setattr, etc.) are handled directly by tmpfs. 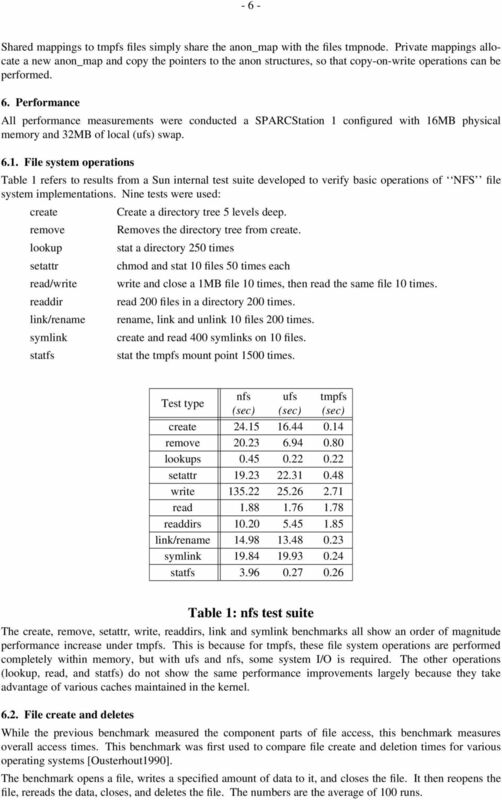 Tmpfs uses system virtual memory routines to read and write file data. Page faults are handled by anonymous memory code which reads in the data from a swap device if it is not memory resident. Algorithms for some basic file system operations are outlined below mount Tmpfs file systems are mounted in much the same manner as any other file system. As with other file systems, a vfs structure is allocated, initialised and added to the kernel s list of mounted file systems. A tmpfs-specific mount routine is then called, which allocates and initialises a tmpfs mount structure, and then allocates the root directory for the file system. A tmpfs mount point is the root of the entire tmpfs directory tree, which is always memory resident read/write The offset and vnode for a particular tmpfs file are passed to tmpfs through the vnode layer from the read or write system call. The tmpfs read or write routine is called, which locates the anon structure for the specified offset. If a write operation is extending the file, or if a read tries to access an anon structure that does not yet exist (i.e., a hole exists in the file), an anon structure is allocated and initialised. If it is a write request, the anon_map is grown if it is not already large enough to cover the additional size. The true location of the tmpfs file page (i.e., the vnode and offset on the swap device) is found from the anon structure. A kernel mapping (using a seg_map structure) is made to the swap vnode and offset. The kernel then copies the data between the kernel and user address space. Because the kernel mapping has the vnode and offset of the swap device, if the file page needs to be faulted in from the swap device, the appropriate file system operations for that device will be executed Mapped files Mappings to tmpfs files are handled in much the same way as in other file systems. A seg_vn structure is allocated to cover the specified vnode and offset range. However, tmpfs mappings are accessed differently than with other file systems. With many file systems, a seg_vn structure contains the vnode and offset range corresponding to the file being mapped. With tmpfs, the segment is initialised with a null vnode. Some seg_vn segment driver routines assume that pages should be initialised to the vnode contained in the seg_vn structure, unless the vnode is null. If the vnode is set to be that of the tmpfs file, routines expecting to write the page out to a swap device (e.g., pageout daemon), would write the page to the tmpfs file with no effect. Instead, routines initialise pages with the swap vnode of the swap device. 6 -6- Shared mappings to tmpfs files simply share the anon_map with the files tmpnode. Private mappings allocate a new anon_map and copy the pointers to the anon structures, so that copy-on-write operations can be performed. 6. Performance All performance measurements were conducted a SPARCStation 1 configured with 16MB physical memory and 32MB of local (ufs) swap File system operations Table 1 refers to results from a Sun internal test suite developed to verify basic operations of NFS file system implementations. Nine tests were used: create Create a directory tree 5 levels deep. remove Removes the directory tree from create. lookup stat a directory 250 times setattr chmod and stat 10 files 50 times each read/write write and close a 1MB file 10 times, then read the same file 10 times. readdir read 200 files in a directory 200 times. link/rename rename, link and unlink 10 files 200 times. symlink create and read 400 symlinks on 10 files. statfs stat the tmpfs mount point 1500 times. Test type nfs ufs tmpfs (sec) (sec) (sec) create remove lookups setattr write read readdirs link/rename symlink statfs Table 1: nfs test suite The create, remove, setattr, write, readdirs, link and symlink benchmarks all show an order of magnitude performance increase under tmpfs. This is because for tmpfs, these file system operations are performed completely within memory, but with ufs and nfs, some system I/O is required. The other operations (lookup, read, and statfs) do not show the same performance improvements largely because they take advantage of various caches maintained in the kernel File create and deletes While the previous benchmark measured the component parts of file access, this benchmark measures overall access times. This benchmark was first used to compare file create and deletion times for various operating systems [Ousterhout1990]. The benchmark opens a file, writes a specified amount of data to it, and closes the file. It then reopens the file, rereads the data, closes, and deletes the file. The numbers are the average of 100 runs. 8 -8- facilities to perform file system operations. It provides additional file system space, and supports UNIX file semantics while remaining fully compatible with other file system types. 8. Acknowledgements Thanks to Glenn Skinner, Howard Chartock, Bill Shannon, and Anil Shivalingiah, for their invaluable help and advice on this paper and the implementation of tmpfs. Also thanks to Larry McVoy for lively debate and suggestions, Marguerite Sprague for editing skills, and Herschel Shermis who wrote the initial implementation of tmpfs. References Gingell1987. 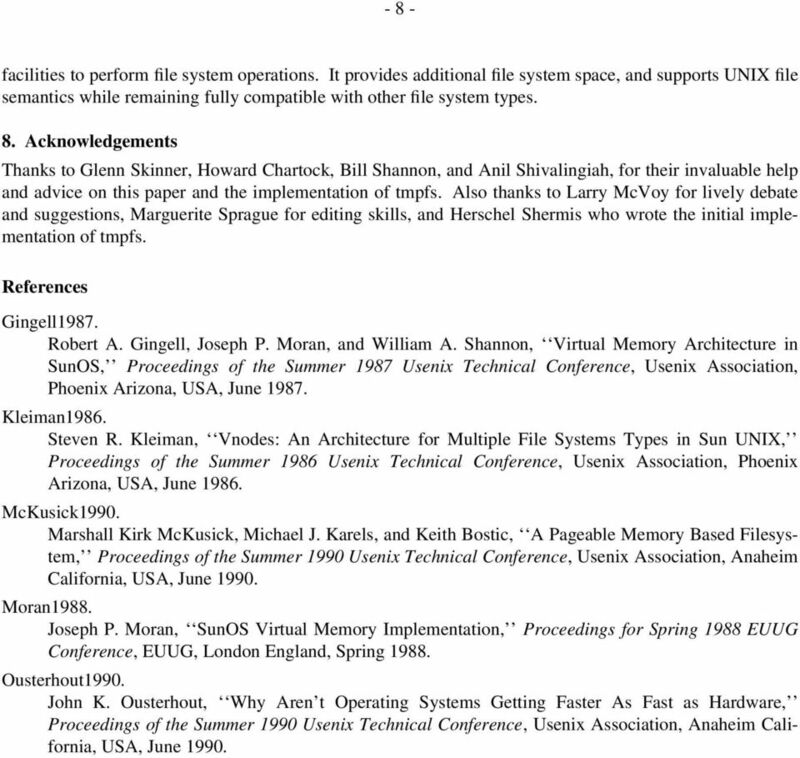 Robert A. Gingell, Joseph P. Moran, and William A. Shannon, Virtual Memory Architecture in SunOS, Proceedings of the Summer 1987 Usenix Technical Conference, Usenix Association, Phoenix Arizona, USA, June Kleiman1986. Steven R. Kleiman, Vnodes: An Architecture for Multiple File Systems Types in Sun UNIX, Proceedings of the Summer 1986 Usenix Technical Conference, Usenix Association, Phoenix Arizona, USA, June McKusick1990. Marshall Kirk McKusick, Michael J. Karels, and Keith Bostic, A Pageable Memory Based Filesystem, Proceedings of the Summer 1990 Usenix Technical Conference, Usenix Association, Anaheim California, USA, June Moran1988. Joseph P. Moran, SunOS Virtual Memory Implementation, Proceedings for Spring 1988 EUUG Conference, EUUG, London England, Spring Ousterhout1990. John K. Ousterhout, Why Aren t Operating Systems Getting Faster As Fast as Hardware, Proceedings of the Summer 1990 Usenix Technical Conference, Usenix Association, Anaheim California, USA, June 1990.